Any audiophile worth their salt has heard of Clearaudio. Fantastic turntables, up to and including the monster Statement table for $150k, a wonderful array of phono cartridges, great record vacuum machines and many other products related to the reproduction of vinyl! One such item is the subject of this review: the 2-chassis Clearaudio Basic Plus phono stage with the optional Accu + battery Power Supply. The Basic Plus phonostage offers both MM and MC capabilities, with enough gain to drive the lowest output cartridges. It is a very simple unit to operate with a single-button switching between MM and MC functionality. Another nice feature is the dedicated power transformer, which resides outside the actual phonostage to keep the audio circuit as quiet as possible. The Basic is available in silver finish only. The past year I have had a very intense interest in phono stages as I have added and subtracted phono cartridges to my system, not the least of which has been a $10k Koetsu Azule stone bodied, platinum moving coil cartridge. The common thread has been moving coil and very low output, which always presents a problem when mating up the cartridge to a phono stage. I have had phono stages in excess of $5,000 and have had phono stages below $1,000 and everything in between. The Clearaudio unit comes in at $1,800 for the full package. Garth Leerer of Musical Surroundings, the U.S. distributor of Clearaudio, was kind enough to leave the unit with me for an extended review period, which gave me ample time to learn the ins and outs of a unit, the chance to use it with plenty of differing and complimentary equipment and also the chance to evaluate it against similar products. In a nutshell, this little phono stage does a great deal of what the big expensive units do without some of the bells and whistles and without the extra cost that usually comes with all of that. If you need a phono stage that is quiet, will handle and moving magnet cartridge all but the absurdly low output moving coil cartridges with extremely low noise flooring and great dynamics, among other things and you do not want to take out a second on the house, then read on. If you want on the fly impedance switching and infinitely variable gain adjustments, or if you want it to make you a smashingly good cappuccino, then back out of the review slowly and go looking elsewhere. 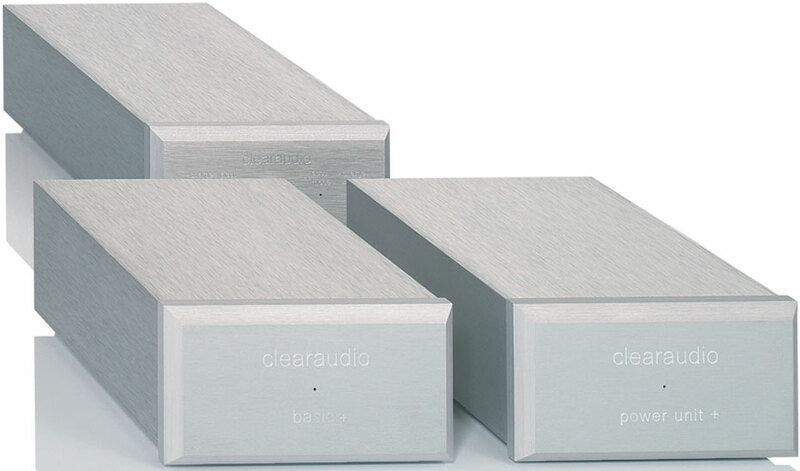 The Clearaudio Basic Plus phono stage is a two-box affair and thankfully the boxes are small, easily stackable and quite attractive. The system consists of the phono stage itself and its outboard power supply initially, plus a third chassis for the additional battery power supply. All in all, the entire stack is 5.5 inches tall by 4.5 inches wide and 8 inches deep (the battery power supply is almost 2.5 inches deeper than the other two pieces). The whole affair is tidy and easily placed within a rack or on a stand. The unit is not only compact but it is also very dapper looking with its machined aluminum face plates. It looks more expensive than it is. I immediately hooked up the two mini-chassis Basic + phono stage minus the Accu + battery Power Supply in my main reference turntable setup. The Clearaudio does not have an ON/OFF switch and is designed to be on at all times. A word of warning, it takes a while for the unit to fully burn in. That being said, if you have the patience to run it long hours and let it settle in, it will reward you for your patience. You won’t be buying this unit to impress your audio friends, especially not if you want a massive chassis or bells and whistles. The Clearaudio, however, is a great performing phono stage at a price that will not require the Fed to advance you Tarp money! The unit is very straightforward with no unnecessary bobbles and bangles. The closest you will come to that is the blue led lights on the battery supply denoting ON, CHARGING or STANDBY. What is really great news is that this phono stage performed more than admirably with every cartridge I ran through it. The cartridges used over the period of six months ranged from a Dynavector 17D at roughly $1,100 to the full-on Koetsu Tiger Eye Platinum at $13,000. The Clearaudio pulled out the very best of each and every one of those cartridges. This is the type of product that can open new doors in vinyl reproduction without breaking the bank. You could easily mate this up with any mid-line cartridge and be happy listening to your vinyl collection for a millennium. I found the combination of the Basic Plus and the Koetsu Urushi Vermillion to be a particularly well mated duo and I ended up setting this combo up in my Nottingham Hyper Space rig for the bulk of the review time. It treated my vinyl very well and was especially kind to high quality, reference level recordings. The Basic Plus made the most out of any source I threw its way but there is no doubt that the old adage of “garbage in, garbage out” holds true with this unit. Feed it source material that is compressed, over produced and full of effects (think Phil Spector and “Let It Be”) and you will get that kind of sound right back out of the unit. Treat it to well-engineered, high-quality vinyl pressings and you will get extremely enjoyable music with all the detail and excitement you could want. Speaking of which I have lately been into listening to Janis Ian’s Breaking Silence (Analogue Productions CAPP 027) again after a long hiatus. As reference recordings go this is really a must-have recording and the song “Tattoo” is one of the can’t-miss cuts on the album. Janis’ vocals are incredibly rich, vibrant and ring through the pain of being a young girl in a Nazi concentration camp. At once both soft and delicate and yet able to paint the picture of unbelievable horrors that befall the young girl. No colorations, just detailed, pure and able to transmit all the pain and agony of the song’s subject. High frequencies were there without any undue fanfare, and the bass, one of the song’s strong suits was extended, clean and forceful. On orchestral pieces like Rodrigo’s Concerto de Aranjuez as performed by the Romeros (Phillips 9500 563), all instruments were set out in the soundstage with the appropriate weight, detail and ambience on a very wide and equally deep soundstage. The guitar reproduction was particularly fetching in terms of detail, timbre, transients and string articulation. The feel and sound of flesh on the cat gut strings was particularly real. (Cat gut?! –Ed.) As a guitar player I actually find myself sensing the pressure put on the strings during particularly well reproduced recordings, and this is one of those recordings that will give me that sensation when accurately rendered. The Clearaudio Basic did a fantastic job of presenting that last little bit of detail that makes the difference between enjoyable listening to the performance and being immersed in it as though you are a part of it. Does not sound like the quantum leap that it really is but quantum leap is exactly what the Clearaudio does for the performance. I have a $700 phonostage that was reworked by a rather famous manufacturer and I have put that up against some pretty expensive gear. Most of the time it will hold its own or actually outperform the higher priced spreads. Not this time. The Clearaudio strummed it, as it also did with a rather expensive French made phonostages. This is a unit that will convince you it cost a lot more than it does. I detected only a very few niggling, little remotely negative issues. I noticed, particularly on some rock recordings, a very slight heaviness in the upper bass that became present on those tunes in which electric bass featured prominently on the recording such as Animal Logic’s What Looks Good on the Outside. On classical recordings, the extreme upper registers of some instruments seemed to lack a bit of top-end sparkle and air. Finally, when presented with highly complex orchestral works the overall presentation was a bit tense in the upper midrange, but only during the most dynamic passages. None of these issues interfered with my enjoyment nor would they detract me from purchasing the unit. They are just the nitpicky little items that a reviewer goes looking for so that they can have something negative to say lest they look like they are gushing over an item. Now, here is the part of the previous statement that renders it in the context it truly belongs in. This was all before engaging the battery power supply. Suddenly, the noise floor dropped dramatically when the power went from a/c to battery. This was not a subtle difference either but rather noticeable and considerable. Las Vegas has some rather noisy electricity. With the vast majority dedicated to the operation of the casinos, you might well imagine what the rest of us are left with and even when run through decent power conditioners, 60 cycle noise is still a challenge. I have more conditioning that Doan’s has pills (disclaimer- Dagogo does not endorse nor receive royalties from Doan’s or any other pharmaceutical company but the writer likes to use these quaint little colloquialisms just to drive his publisher crazy). (Ha. Ha. –Ed.) Phono stages with gains of 60dB or higher seem to simply transfer every little bit of hum that can possibly be found in the lines straight to the amplifier and speakers. Consequently, I always am aware of any hum, and precious few phono stages work in my home without adding to the problem. This is the first phono stage under $5,000 that has done an admirable job of keeping the noise down to a level that is almost nonexistent. That makes it a hero in my eyes for that feature alone. When you add in the simplicity of use, the attractive and compact design and a price south of $2,000, you have what I call a winner. Also, the top-end seemed to become a tiny bit more extended, the upper midrange a bit more relaxed, and overall, the sound just became that much better. Interestingly, I found that many times I just caught myself listening to the music and not to the phonostage. The longer I am in this hobby and the more critical type of listening I do, the more I value that one simple little thing: the review unit’s ability to let the listener hear the music and not the gear. When you are sitting down to evaluate a piece of audio equipment you tend to focus intently on how the item changes the sound of your system. You find yourself looking for things like additional space around the instruments, a larger sense of scale, compressed highs, sibilants, can you hear a pixie fart on the track? I just love it when I catch myself actually not listening for those things and simply listening, too, and enjoying the music that is playing. When you can do that you have stumbled on something that speaks greater volumes of the item’s quality and value than all the poetic prose, waxed or not, that any writer can muster. In closing I can find no more flamboyant words or prose to speak to the enjoyment I had living with this unit over the past six months. If you are in need of a phono stage that can handle most anything you throw at it, don’t want something overly fussy and want to listen to the music that can be extracted from your vinyl and not listen to the extractor, then seek out the Clearaudio Basic Plus with the optional battery power supply, hook it up, run it in and forget about it and get back to doing that is truly important – listening to the music! I bought this unit and I am very happy with it. Just broke the needle on my Sumiko Blackbird Cart. and I am in the process to purchase another Cartridge, could you make any suggestion about a different Cart. in the $1000.00 range or should I go again with the Sumiko? How about the Ortofon Quintet black? Is the Clearaudio battery power supply would give the same good results in dropping noise floor, from a MM cartridge 2.5mV output, as a MC 0,3 mV ?